Just a twenty minute period twice a week, no pain and no heat with 80 proprietary lasers at a wavelength of 678nm. Clinical strength, hands-free technology and FDA cleared for absolute safety. Specifically for those suffering from Androgenic Alopecia. Hair growth has been seen from as early as 4 weeks of use. Affordable- no on-going cost or traveling costs to treatment clinics. The Theradome PRO is a unique Laser Phototherapy (LPT) helmet for home use. It was the first over the counter, wearable laser hair therapy device to be cleared by the FDA for treating hair loss. Theradome has been designed by scientists and engineers to be a convenient consumer friendly answer to hair loss treatment. Designed to cover a large scalp area and treat all regions affected by androgenetic alopecia, the proprietary laser diodes flood the scalp with coherent light at a wavelength optimally tuned to penetrate to the depth of the hair follicle. Technically similar in wavelength, power and the number of lasers to a clinical machine, this lightweight 80 diode laser helmet is simple to use in the comfort of your own home. The only difference between Theradome and a clinical machine is a lower price and greater convenience. The rechargeable battery allows at least 6 treatments between charges and Theradome will tell you when it needs to be recharged. The rechargeable feature means you do not have to sit by a wall socket to carry out your treatment and are free to move around. Theradome’s voice will tell you how many treatments have been performed so far each time you switch it on. It will also tell you every 5 minutes how long your remaining session time is then at the end of a session it tells you that the treatment is complete before automatically switching off. There is no LCD display or remote control, all functions are carried out by the single round button at the rear of the unit. There are numerous features built into Theradome® to ensure user comfort and safety. One of which is the proximity sensor which ensures Theradome’s lasers are only activated while on the head, preventing the user looking at the active lasers. Safe and easy for home use to achieve thicker, fuller hair in just 4 months. Stimulates strong hair regrowth and combats thinning hair and hair loss in both males and women. Achieve incredible results in just 20-25 short minutes every other day. Noninvasive therapy and relaxed to wear for thicker healthier hair. Low-Level Light Therapy (LLLT) results are not superficial – cells absorb the light and in turn become more active. This procedure is known as photo-biostimulation and is just like giving your cells vitamins for a healthy metabolism. Cells then begin to repair and revitalize themselves, leading to thicker, fuller and healthier hair. The iGrow Laser Hair Rejuvenation System has been clinically-proven and offers confirmed results that are supported by medical analysis. Unlike most other hair laser treatment options, iGrow uses a combination of LED and laser technology, at a clinically proven wavelength of 655 nanometers. The distinctive design of the iGrow helmet is specially contoured to cover your entire scalp for the most effective treatment possible in the shortest amount of time. 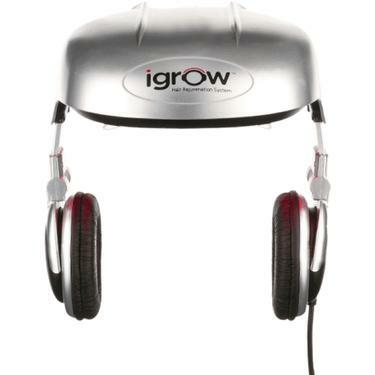 A hands-free design is much more convenient than hair-loss laser combs and the distribution of the low-level laser and LED lights inside the iGrow helmet ensures that the therapy focuses on precisely the parts of your scalp that need it most every time. Conventional laser combs and brushes, while they can offer an effective treatment, are not hands-free, and don’t provide full scalp coverage, nor do they offer the blend of LLLT and LED technology at the same time for the most effective results. the control unit that most closely resembles your type of hair loss. Entertainment while it works – the iGrow comes complete with a 3.5mm audio jack which can be plugged into your MP3 player or tablet, letting you enjoy your music or favorite TV programme while the iGrow does its work. 100% of iRestore consumers achieved new hair growth. Secure and simple laser treatment in the comfort of your own home. A fraction of the cost compared to hair treatment clinics. Visible hair growth with an average increase of 43.2%. iRestore enables specialist laser treatment against hair loss and thinning hair, in the comfort of your own home. 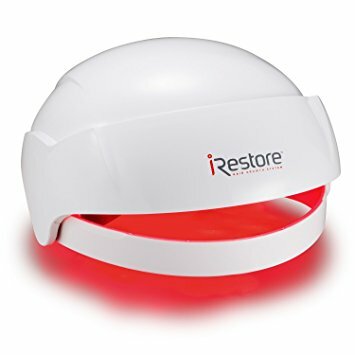 iRestore uses clinical-strength laser technologies approved by the FDA to treat women and men who suffer from alopecia (genetic hair loss) or have thin hair in need of volume. 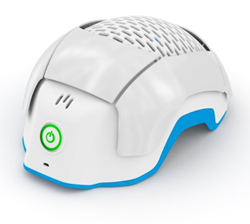 This laser helmet uses painless, medical laser to biologically stimulate the scalp cells to grow thicker and healthier hair. You will get free mobility when using iRestore Laser Hair Growth System 2.0. The iRestore hair laser system is designed to be light, comfortable and durable. The hands-free design allows unrestrained and full freedom to complete your day as usual. iRestore provides a safe, medicine-free way to experience hair growth without adverse side effects. Individual results may vary, however, you can expect visible growth in as little as 3 to 6 months. iRestore has provided new hair growth with thicker and healthier hair for thousands of customers in the United States. The best part is that it is pain-free, noninvasive, and hassle-free! Our team of specialized technical engineers have designed lasers to emit 650nm red light wavelengths in order to most effectively target hair growth. Results will vary from person to person, but you should see positive results between twelve to twenty-four weeks.